The Campus Activities Board announced April 3 in person and via social media that Spring Jam 2014 will feature Krewella, Logic and Radical Something. The event will be part of Karmaloop and eMuze’s Verge Campus Tour 2014. Krewella will headline the show and Logic and Radical Something will perform as openers. Spring Jam 2014 will take place in Lot F at 31st and Ludlow streets May 10. This is the same venue as last year’s, making it the fourth Spring Jam to be held outdoors. The concert will start at 6 p.m. and end at 10 p.m. Doors will open at 5:30 p.m. The announcement took place in front of the Mario statue at noon. Students learned about Spring Jam 2014, took a shot at spinning a prize wheel and won CAB-branded merchandise, which included draw-string bags, sunglasses, lanyards and pens. Students were also offered free cupcakes and the opportunity to purchase tickets in advance. Krewella, mostly known for the hit “Live for the Night,” is an electronic dance music trio band from Chicago. Their musical style draws influence from electro house and dubstep. 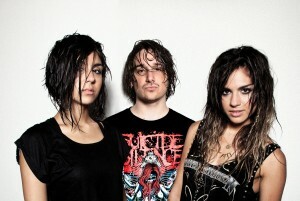 Krewella’s most recent album, “Get Wet,” released in 2013, topped the U.S. Billboard dance-electronic albums music chart. One of the openers, Logic, is a 24-year-old American rapper who has released four official mixtapes. His video “All I Do” successfully hit over 1 million views on YouTube. In 2012, Billboard declared him the Next Big Sound, referring to him as the fastest accelerating artist to gain fans from the Internet. Radical Something is a trio that dabbles in many genres, including alternative, hip-hop, reggae and pop. The band has been reviewed as “blend[ing] hip-hop and rock with a decidedly Californian vibe,” according to Billboard.com. Spring Jam 2014 is a collaboration between CAB and the Verge Campus Tour 2014. Verge Campus is a national music tour that takes place annually across various college campuses in the United States. The Verge Campus Tour is a confluence of concerts featuring diverse music styles in multiple genres, aiming to create new and invigorating college experiences on campus. Krewella, Radical Something and Logic will journey across colleges throughout the East Coast states and end up at Drexel University. Previous Spring Jams have featured OK Go, Super Mash Bros., Cheers Elephant, The Wonder Years, Man Man, LA Riots in 2012, and B.o.B. and Major Lazer in 2011. Tickets are now available online at dusj.ticketleap.com/2014 at $5.00 for Drexel students and $10.00 for guests. Students are permitted to purchase tickets for two guests per Drexel ID.